Spring in Michigan is a great time to get outside out and explore. The temperature is just right, not too hot, not too cold; flowers are blooming, and the skies are finally clear of snow. Springtime is also one of the best seasons for festivals in our great state. Wherever you are headed, our team has a fun festival and city for you to discover. While not technically a festival, Opening Day is quite the spring occasion, especially in Detroit. On Thursday, April 4th, the Tigers will play ball for the first time this season against the Kansas City Royals. Score tickets if you want to sit in on the action live, or take a trip to Detroit and stop into any restaurant or bar, as the whole city will be celebrating the start of the season. Spring break for most schools falls during this week, so if you aren’t heading down to Florida with the rest of Michigan, take a trip to Detroit! Don’t forget to wear your Tigers gear and grab some sunglasses. Need a new pair? Our style-wise opticians would love to help you find the perfect pair for a day at the ballpark. 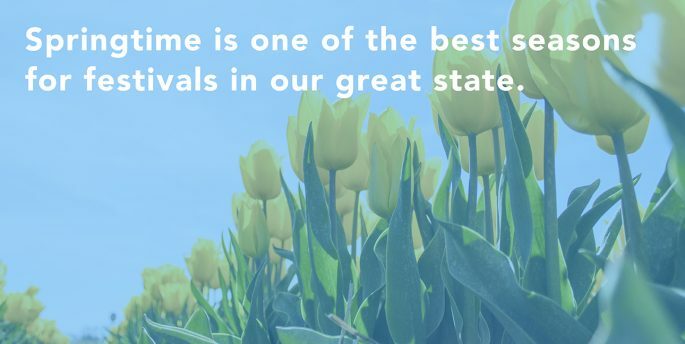 For 90 years, the lakeshore town of Holland has been celebrating its Dutch Heritage with their Tulip Time Festival. In 1929, the City of Holland planted its first 100,000 tulips; now there are tulips all over the city for you to enjoy. Although they are the highlight, the tulips are only just part of the Tulip Time Festival! There are Dutch dancers to watch, trolley tours to enjoy, and lots of other Dutch traditions to take part in. This festival takes place May 4th to 12th. With new activities happening every day, you won’t want to miss out on any of the fun. If you love food and history, make your way to Ann Arbor from May 29th to June 2nd to fill your stomach and brain. Appreciate bacon in a whole new way with this fun camp. Zingerman’s Camp Bacon is bringing in speakers to not only talk about the taste and flavor of bacon but also how to alter the flavor of the bacon by what you feed the animal. We know you’re already salivating, so grab your tickets before they’re gone! This 10-day celebration on every Michigander’s favorite island is happening June 7th through 16th. This event kicks off summer on the island – and that’s why we included it! Head up north to start off spring the right way, at the Lilac Festival. There are plenty of fun activities on the island, from the coronation of the Lilac Festival Queen and Court, a 10k run/walk, and horse-drawn carriage tours, to concerts and wine tastings! No matter who you go with, everyone will be doing something they love. And to top it off, you’ll be surrounded by beautiful Michigan lilacs. This free, three-day event in downtown Grand Rapids is celebrating its 50th year and we are excited to take in all the art, music, and dancing. Did we mention there is amazing food from various cultures, too? There are countless interactive elements to the festival that kids (or adults!) of any age will enjoy. If you aren’t able to make it up to Mackinac Island for the Lilac Festival, never fear, Festival of the Arts takes place from June 7th through the 9th, so you’ll still be able to enjoy a Michigan spring festival before spring turns to summer. Ready to take on a Michigan spring adventure? Whether you need sunglasses, a cleaning and adjustment for your glasses, or new contacts, our expert team are here to ensure you see our great state clearly. Stop in to one of our 54 locations or call us to set up your appointment today!